Crewe boss Steve Davis sees Saturday's final-day game with Preston as a chance for Chuks Aneke to atone for getting suspended at a key point of the season. 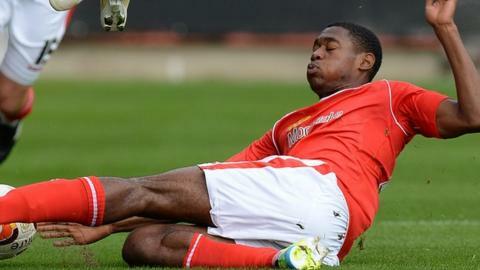 Aneke is due to return from his three-game ban for the red card he received for elbowing Wolves' Richard Stearman. The Alex must win to be sure of keeping their League One status - and Davis is looking to his 16-goal top scorer. "I'm sure he'll look to the Preston game and want to put things right," Davis told BBC Radio Stoke. Crewe have not won in seven home games since their 3-0 victory over Sheffield United on 1 February. "He's been terrific for us all season and will be really determined to help us stay in the league. "But, at the back of his mind, I'm sure he'll be thinking he's let us down by not being available for these past three games." There is the issue for Davis of whether to make any changes at all as, since losing 2-0 to Wolves at Gresty Road following Aneke's sending-off before half-time, Crewe have gone unbeaten in three games. But, although they won 3-1 at Shrewsbury, they have failed to score in their last two matches - and have not won at home in three months. And Aneke's availability, plus the prospect of a recall for teenager Max Clayton for the first time since his broken ankle in November, would improve the Alex's attacking potential. "Margins have been very fine this season between winning and losing," added Davis. "We've come out the other end too often." What Crewe must do . . .
Crewe will be safe if they win or draw, Tranmere lose and Carlisle win by more than four goals at Molineux. Crewe will be relegated if they lose and either Tranmere avoid defeat or Carlisle win with a four-goal swing in goal difference. Or, if they draw and Tranmere win - discounting an implausible 15-goal defeat for Notts County. Captain Matt Tootle told BBC Radio Stoke: "If we'd lost our last three games it would have been mentally tough for us. "But, while we all know Preston have been one of the best sides this season, we're on one of our better runs. That's going to add to our confidence and momentum. Every time we've been asked to raise our game we've been able to." Starting the day in 20th, a point clear of Tranmere Rovers, Crewe are comforted that their future is in their control. But Davis admits that he will want to be made aware of how things are going for 22nd-placed Carlisle, who face champions Wolves at Molineux, 21st-placed Tranmere, who host Bradford, 19th-placed Notts County, who are at Oldham, and 18th-placed Colchester, who travel to Walsall. "The professional approach will be to know what we need," said Davis. "It's important to know what the other four clubs involved in it are doing. "We might need to score a goal, we might need not to concede another. We might need a point. We might need to win, so we would want to know. "I will be kept informed. I'm sure the scores will filter through to the fans and my staff will keep an eye on things."